Annie Vincent Interiors: What are you bringing to the Superbowl? What are you bringing to the Superbowl? It's Superbowl weekend. Whether your team is playing or not, it's a great time to get together with family and friends! Here is a delicious and easy appetizer I got from a friend. She called them jalapeno poppers, but don't worry they aren't fried. But you will be popping them into your mouth over and over again! Cut jalapenos in half, lengthwise. Use a spoon to remove the seeds and veins. Fill each little jalapeno boat with softened cream cheese. 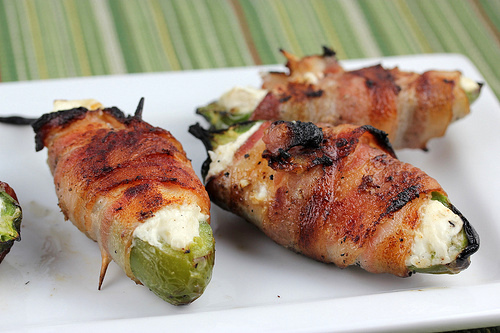 Wrap one piece of bacon around the jalapeno, securing the bacon with a toothpick. Sprinkle brown sugar over the top of the jalapenos and bake them at 350 degrees for 20 min, or until the jalapeno starts to shrivel on the ends. These look amazing! I might just have to add these to our Super Bowl Menu! Thanks for the recipe. Have a great weekend!